Summary: This collection of readings is intended to inform the thinking and practice of teacher leaders and teacher researchers interested in addressing the racial gap in achievement by expanding their own knowledge base as they seek to enhance the academic performance of African American learners. These texts have supported the contributors as they have examined the history and status of African American education in our nation in the context of the landmark decision rendered in Brown v. Board of Education (1954; 1955). If you desire inspiring readings to further knowledge of social justice or culturally relevant pedagogy, this bibliography offers a place to begin and to build from, adding resources that go beyond its publication date of 2008. 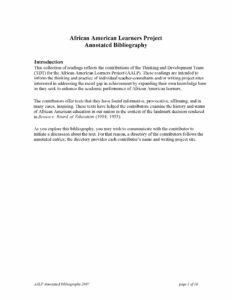 This collection of readings reflects the contributions of the Thinking and Development Team (TDT) for the African American Learners Project (AALP). These readings are intended to inform the thinking and practice of individual teacher-consultants and/or writing project sites interested in addressing the racial gap in achievement by expanding their own knowledge base as they seek to enhance the academic performance of African American learners. The contributors offer texts that they have found informative, provocative, affirming, and in many cases, inspiring. These texts have helped the contributors examine the history and status of African American education in our nation in the context of the landmark decision rendered in Brown v. Board of Education (1954; 1955).